The Oregon Hole gorge on the Middle Fork of the Smith River is a lot of fun and very scenic. 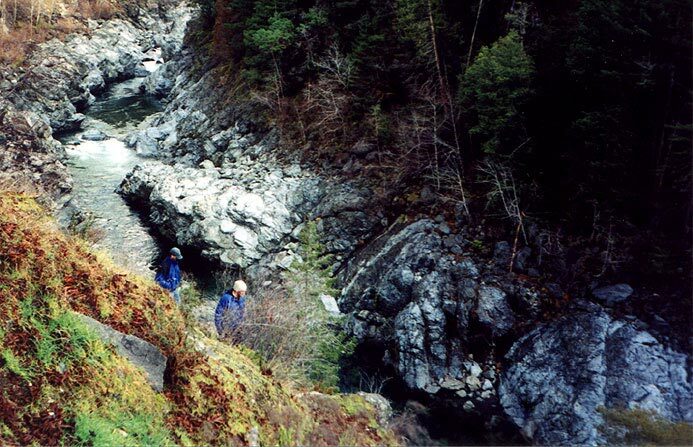 We ran the gorge in the winter of 2001 when the Smith River gauge was running about 1500 and found even this to be a very nice flow for us water-starved Oregonians! Because this run is so short and by the road it is often paddled by rafts, IK's, kayaks, you name it. If the weather is nice expect to have an audience as there are many pull offs and the gorge is something of a tourist attraction. I remember probing the crux of the gorge, and when I got backendered in the hole and flipped, I rolled up to cheers echoing down from above.. We had eleven boaters in our group and a few hadn't paddled much recently due to record low water levels in Oregon. Of course, this meant that carnage was inevitable! Pete and Tom scout a drop in Oregon Hole Gorge. We put on and sprinted down to the beginning of the gorge through some nice warm up class II-III drops. Gradually the walls closed in and the river bent back to the right and started to descend through a series ever-larger drops. There are two main rapids in the first part of the gorge, and both are excellent, with big waves and holes! Gabe catches an eddy below the first few drops. 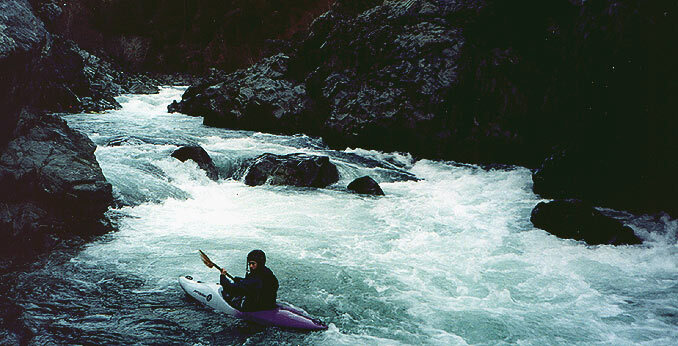 Upstream are some really nice rapids with fun waves and holes. Eventually the gorge narrowed down and we were confronted by a narrow drop where the river piled into a boulder in the middle of the river. The central 'pillow rock' divided the current- on the left side the current piled up against the canyon wall, and on the right it fed into an ugly pocket with a small suckhole exiting out the back. Gabe, Brad, and I had arrived first and I looked at Gabe, who shrugged as if to say: "It's me or you and I don't mind either way..."
I grinned and peeled out. I charged downstream straight at the midstream boulder and plunged into a big hole just above it that had been invisible from the pool above. I went deep and emerged in a HUGE backender... The boulder rushed past me on my right and I could hear cheers from the wall above as I went end over end and flushed out. I rolled up and caught an eddy- Gabe's wife Doe was perched on the wall above, grinning. "That was great!" she said. 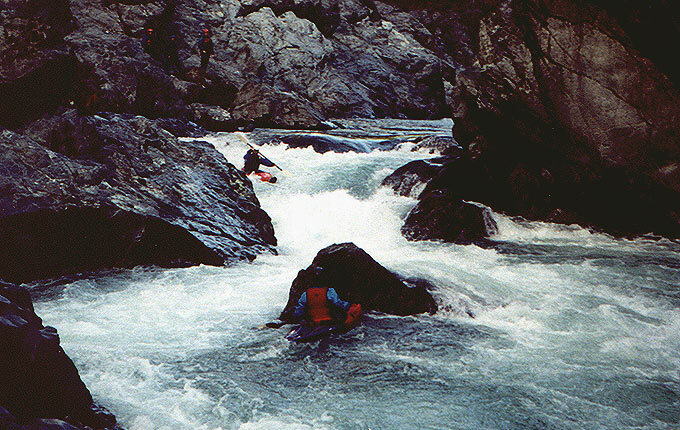 Below the pillow rock drop are a couple of smaller rapids, some very nice scenery, and then the final rapid, Oregon Hole. At this low flow the river divided around a couple of huge boulders. We ran through the left slot and then scrambled to the right to avoid some boulders. I think in the end we all agreed with what the guidebook says: "The only thing wrong with the Oregon Hole Gorge is that it's too short!"